Lambton scored three goals in the second half against Hamilton for the second time this season as the Jaffas fought back from a first-half deficit to claim all three points in the ‘Match of the Round’. Lambton Jaffas 3 (Griffiths (p) 52’, Remington 56’, 62’) defeated Hamilton Olympic 2 (Goodchild 44’, 79’) at Arthur Edden Oval. Jaffas coach James Pascoe said post-match that his side rode their luck and added: “we are not doing cartwheels at the minute”. Pascoe hit the nail on the head, after a match where they could have been down by at least three goals at half-time. Unlike their meeting in round one, Olympic didn’t come out all guns blazing and were composed and methodical and quickly gained the ascendancy. Much of the opening half was played down Lambton’s defensive end as Kane Goodchild and Scott Smith threatened without creating any golden chances early. Sean Pratt slid a shot wide with the outside of his boot midway through the half before hitting the post from close range moments late. Pratt was in the thick of the action in the opening 45, and in the 32nd minute, he was lucky to stay on the ground after diving in on Lambton’s Riley McNaughton. Four minutes later, Pratt’s free-kick from the left edge curled onto the crossbar as another Olympic chance went begging. In the 42nd minute, another of Pratt’s free-kicks cannoned off the post, this time from the right edge swinging into the back post. However, just two minutes later Olympic had their lead. Michael Session played a pass back to Liam O’Dell who let it run back to keeper Brad Swancott. O’Dell soon realised Session’s pass didn’t have the pace to reach his keeper but reacted too late as Kane Goodchild came steaming through and tapped the ball past the onrushing Swancott and the diving O’Dell. Valentine Phoenix 3 (Paul 45’, Brown 76’, 80’) defeated Charlestown City Blues 1 (Ferguson 12’) at Cahill Oval. Valentine continued their strong form in the PS4 NPL Northern NSW, coming from a goal down to keep their undefeated record alive at Cahill Oval this season. With a depleted side, the Phoenix dug deep, with young winger Dean Pettit making his starting debut and 20-year-old Reece Pettit debuting as Captain with Scott McGinley away in China. However the match didn’t start well for the Phoenix, Valentine’s set piece woes continued in the match as Charlestown opened the scoring. Rene Ferguson pounced on a Josh Maguire corner to make it 1-0 after 12 minutes. In what was a hammer blow for the Blues right before half-time Matt Paul scored a stunner after Daniel Minors long range shot deflected off Josh Carroll and back to Paul, who stuck out a left boot. The ball ballooned up and over Charlestown keeper Nathan Archbold to make in 1-1 in the 45th minute. Newcastle Jets Youth 3 (Jennings 64’, Parris 66’, Carroll 68’) defeated Adamstown Rosebud 2 (Read 78’, Hunter 80’) at Adamstown Oval. The Newcastle Jets Youth made it two wins in a row at Adamstown Oval, as they climbed off the bottom of the ladder in a 3-2 win against the Rosebud’s. The match was deadlocked at the break, before coming to life in the second 45 minutes. The Jets scored three goals in four minutes and Adamstown two in two, during a thrilling second half. Both sides created chances in the first half, but, just couldn’t break the deadlock as they headed to the sheds at 0-0. After the break, it was much of the same until the Jets came to life in the 64th minute. The Jets began their three-goal blitz when Cody Carroll dispossessed Cameron Holzheimer and played in Leroy Jennings down the left edge. Jennings stepped inside Rosebud defender Michael Williams with ease and slotted under keeper Riley Hill to make it 1-0. The Jets doubled their lead in the 66th after Finn Parris deflected home a long-range shot from substitute Kaleb Cox. Cox shot from outside the box, and Parris got a boot to it, on purpose, deflecting it inside the far post. The Jets third was the best of the lot, in the 67th minute. Jennings darted down the right and crossed infield to Cameron Joice who back-heeled inside to Cox. Cox’s shot was well blocked by Stuart Musialik, but, unfortunately for the Rosebud’s skipper, the ball deflected off him and into the path of Cody Carroll who volleyed the Jets Youth into a 3-0 advantage. Edgeworth Eagles 3 (Cawley 6’, 58’, Taylor 45’) defeated Broadmeadow Magic 0 at Magic Park. 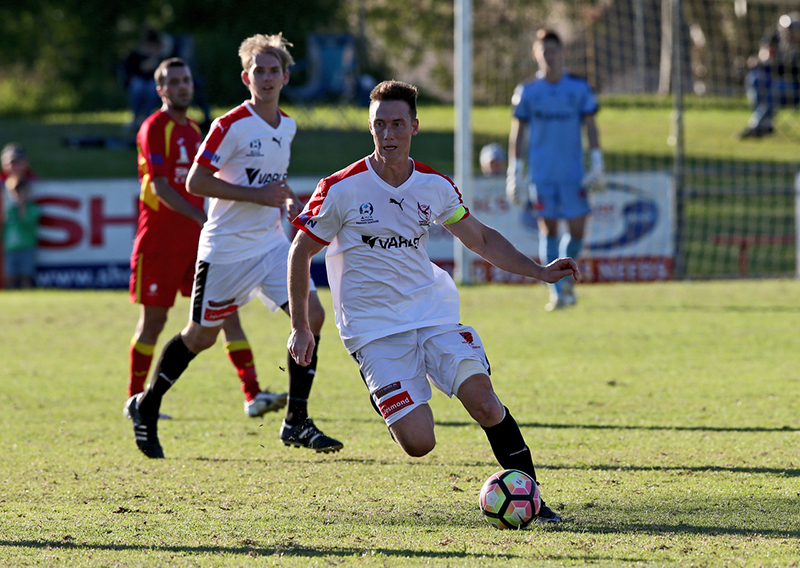 Sunday afternoon saw the Eagles defeat Magic in an ‘easy’ win at Magic Park in round 12 of the PS4 NPL Northern NSW. “I don’t think we’ve ever played Magic and contained them so well,” Eagles coach Damian Zane said after his side sucked the life out of Broadmeadow. The win was the Eagles sixth in a row and returned them to the top of the table after Lambton leapfrogged them a day earlier. For Magic, it was a difficult afternoon, with the Eagles resembling more of a python as they suffocated Broadmeadow’s ball movement and constricted any space in the front third for Magic to exploit. After Adam Cawley’s goal in the 6th minute led the visitors to never look back from then on in the match. Kieran Sander played Cawley in down the heart of Magic’s defence and the youngster finished nicely for his first PS4 NPL goal in Edgeworth colours. Edgeworth continued to probe and create chances, as Brody Tayor went close on a couple of occasions before he finally got the goal he deserved. Lake Macquarie Roosters 2 (Walker 71’, Green 90+2’) defeated Weston Bears 0 at Macquarie Field. The scriptwriters got it perfect on Sunday afternoon as Sam Walker, in his 100th match for the Roosters scored a cracking goal to lead the home side to victory – their first in five matches. Blake Green joined Walker on the scoresheet in the dying moments as Lakes moved up to 5th on the ladder. It was always going to be a tight afternoon; the sides couldn’t be separated when they met in round one and it was deadlocked for much of the contest. Neither could break through in the opening half and headed to the break level. It seemed the match would end at 0-0 until, as he always seems to do when the Roosters need him, Sam Walker stepped up. Walker controlled the bouncing ball after it was cleared up field by the Roosters before unleashing a volley from 35 metres which dipped up and over Bears keeper Kane Runge and into the back of the net. CLICK HERE for a full Round 12 review.